Argh!! 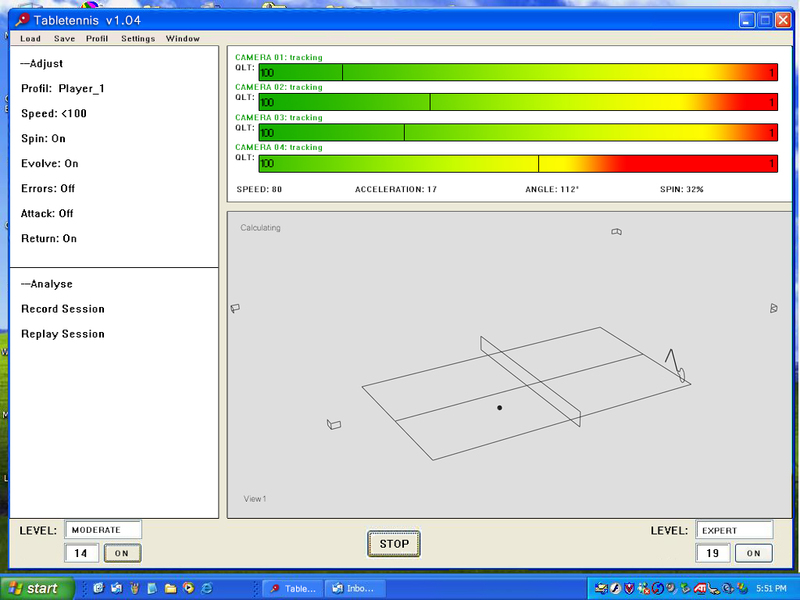 I got plans in my head to make a ball shooter for one man ping pong (A-la trainer, like in real tennis). Fargin Germans have to one up me. Bastards! sorry to tell you that ball shooters (training robots) have been around in table tennis for decades. I’m really surprised nobody else has said it yet. I’m calling fake on this one. It’s clear that at least some physical prototypes were made, but all of the video looks like uncanny valley. The actuators don’t pass the sniff test for smoothness or speed of response. This guy is clever, but this is the second tech hack blog to report this as real, we need to get this troll taken care of. It is so obviously CG, the movements, the matte finish on the robot, the completely unrealistic servo movement. Come on, you guys have used servos before! This guy just built a very expensive wall. I want to see two machines playing each other. Looking forward to that KUKA tournament though. Looks CGI to me, area behind the machine is all grainy. I don’t want to call fake and run, but that video was a bit suspicious. The movements seemed unnatural for the size of the servos and arm structure. If it is real, I want to know what servos were used that can direct drive that much torque that quickly at that size, because I want some. If it is fake, nice job on the CGI. I only questioned it because the movement seemed unrealistically fast. CGI. As others have pointed out, the shadow of the arm disappears when the robot is show from the side, even though they were added in the other shots. My cgi tip off was the cable under the table. It stretches instead of sliding around. My take is that the CGI comments are fake. look closely between 0:04 – 0:09. Parts of the arm actually disappear randomly. I’ll admit i fell for it at first, but if you watch it full screen in HD it becomes obvious. Look at the upper right hand corner of the garage door. But why a CGI camera? It would have been less work to rig up a dummy webcam instead of doing the compositing. It might of course be to fix a continuity error. How can the robot work without the camera being rigged up? That is an impressive table mounting system. No shake at all in the close-up shot despite there being only two positions for bolting the rail thing to the floor. Either Newton’s third law does not apply to this robot, or the robot has zero mass. Even moving the very light printer head on my inkjet printer back and forth would show some vibration in a close-up. Try putting an inkjet on a ping pong table, aim a camera at the corner, and see what it would take to stop any noticeable vibration. The sound is obviously fake. It sounds like a dot matrix printer, and has the same pitch irrespective of the movement, acceleration, or speed of the arm. I hear their next build is a robot that throws knives, saw blades, and hammers, at a speed that could slice pineapples and coconuts. Could this have been a viral to promote the Kuka stunt? i think the amount of time and effort one puts on to learn this CGI, could be enough to that level of electronics to make it a real robot not? I wish there were upvotes for comments to that this could stay at the top. Notice how the STOP button is a rescaled copy of the ON button on the left Also both UI buttons are in ‘focus’ (denoted by the dotted rectangle), which is highly unusual. Notice it’s running Outlook Express and Internet Explorer – no self respecting hacker/maker would run those apps – lol. He should seriously find some sponsor and build another one so he can put it in an art installation, endlessly playing ping pong. I would watch it forever! Some of the metal in the close up shots is really animated-looking, and the servos are REALLY quiet for their speed and strength. An ad to advertise an ad…. we heard you like ads dawg. Fake or not there does not seem any real effort done to score a point at any time. By either the player or the supposed robot. Fake or not, robot players tend to be programmed to win through attrition. It’s easier focus on defense and hope the opponent screws up eventually. Those webcams are the ones made by SGI (formerly SiliconGraphics). There is multiple error in the CGI just between 0:04-0:09, robot parts disappear when moving right, no robot showing all of the time between thumb and hand when it should, part of the hand disappears too. … and thats not even going in to the movement in general. I want that servos… Oh wait! Clearly a fake. Its sad that it fooled Hack a day writers. I would have assumed it to be their responsibility to not perpetuate drivel. Now if this video was rendered on a raspi it would have been different story. also at 0:39 the GUI shows a “spin” value, wouldn’t it be extremely hard to determine the spin of the ball through those cameras? And then again, why don’t those parameters (speed, acceleration, angle and spin) don’t change in the simulation after the ball is hit? It is definitely fake. Watch the middle joint of the arm during the first segment of video you can clearly see part of the joint disappear for a split second. Nothing but CGI. While I have to admit that what I’ve seen so far suggests it’s fake, I have one question. I wonder if it might be possible to parts of the image to either disappear or get overlaid on to another part, if the object is moving quickly, the original footage was shot in a particular way (e.g. interlaced video or noninterlaced), and whether whatever has been used to create a screen capture from the video (to make the animated GIFs) could introduce artifacts like this as well. Hope that makes sense. Any ideas? It obviously doesn’t get over the other things like the cable and screenshot! The video is clearly not interlaced (theoretically it could have been de-interlaced at some point before upload and/or by YouTube) and the screen captures I made were straight from the 720p YouTube stream without any modifications in playback. While it is possible for interlaced footage to have artifacts due to two frames being mixed from different times, the overlay certainly is impossible. Overlaying would require incredibly fast motion, and the general area behind the paddle would be overlaid, not just the CGI camera. definitely looks fake, it responds way too quickly and way to smoothly, it would have to move way faster and more jerkily to be real. I would have to say its definitely not the later option. I forgot to mention that you can look at the slack at 2:35…. that is where you can see it best. The Kuka one is either fake or heavily edited to the point of not being a real depiction. The motion of the ball when the robot is balancing it while rotating the paddle doesn’t sit right, and it bounces the ball straight up by itself with the bat at an improbable angle. Let’s not focus on the robot arm and the movement speed, because I think that’s not unrealistic. Think about the software and have a look at the website, the screenshot of the application etc. The software would *not* be just a tiny part of the whole project, it probably would be one of the most challenging part. And then again the website suggests that it’s done over-night. WTF? He’s showing videos of development steps of the hardware but almost no word of the software. Then suddenly it all was done. No need to be proud of tiny successes – clearly he must be a genius that gets complex software done on the first try. That ‘explains’ the information-lacking GUI of the supposed control software. I’d expect a lot more and actually telling debug/control output messages. Just one single meter value for each camera with fancy display consuming a lot of window space…? Ah, camera btw: they look like they were just mounted anywhere, loose or whatever. That I cannot believe. You wouldn’t want to tilt the picture by software rather than just make sure the camera is placed correctly. And about placing the cameras: you would want to locate them symmetrically with regard to the table in order to handle each camera data generally the same way and not to adapt for all the variations (you’d do that at a much later stage of the project). the software (gui) is too simple and does not reflect the complex task. The location and orientation of the cameras are essential to the workload, yet seem irrelevant in the video. You can see, that it is definitly CGI, the Resolution of the Robot ist different to the Video and you too can’t see a shadow of the robot on the floor. Last, the wire of the robot moves not in the right angle on the floor. Occam’s razor favours the simpler solution. Do you guys really think the CGI solution would be easier? I am a CAD Modeller and Animator by trade and i can tell you without a shadow of a doubt that it is CGI. an honest match would have been great – the hype has failed me, though this was to be expected – but it would be GREAT if it was a proper match – the robot would have probably lost..!! For me the “tell” was that the shutter time differs between the pinpongball and the robot. The robot is rendered with little or no motion blur, while the pingpongball seems to have been filmed with a shutter time of about 1/4th to 1/2 of the frame-time. and this kind of educational robots are very usefull also funny. I wanna see two of it challenge robot vs. robot. The KUKA vs Timo Boll publicity stunt was about as fake as this “maker” project. Since they could afford a world class player who could accurately place balls anywhere on the table, all they needed to do was pre-script every move that the completely blind robot did. It was up to the accuracy and acting abilities of Boll to make it look real. At least this project pretended to have a stereo vision ball tracking system. I was a little disappointed watching the video. You can talk about glitches, stretchy cables, and bits vanishing, but regardless of the details, this video just looks to me like really obvious CGI. After reading the HAD post I thought “ooh this will be fun, time for some clever scrutiny”, but the fun was short lived. Waaay CGI! Why do you build me up, buttercup, baby, just to let me down? 4. Erased the wall colour from the video leaving the ball visible as it travels into and back out of a transparent area on the video, Also erased some areas of the garage door where the robot’s shadow will be. 5. Made his CGI robot put it’s paddle in the right spot at the right time to correspond with the point where the ball bounced off the wall. Very well made I might add. Nice job on the animation! 6. Composited his video with the initial still shot as the bottom layer, the shadow as the next layer, the robot as the next layer, and the video of him playing (with transparent sections for the robot and it’s shadow) as the top layer. What do you guys think? Have I missed anything? You know this “epic face off” for the 11th was also just a PR stunt, isn’t it?